studying and for practicing, but also for integrating into one’s everyday living. The ideas that Dr. Likey discusses have been tested over the years by many of the world’s greatest seers, teachers, authors, and coaches. Spiritual laws are merely metaphors for the natural laws; though unseen, they are always at work in the world around us. 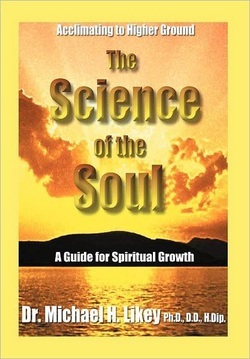 The Science of the Soul offers a path for a deeper connection and the transformation of the soul. Using the methods presented here, you can gain greater quality of life, deeper love, and inner peace, focused on your true life purposes. Dr. Michael Likey is a Clinical Hypnotherapist, Doctor of Theocentric Psychology, teacher, transformational speaker, and motivational life coach. He also produces his own weekly podcasts and webcasts. He maintains a private metaphysical practice on the west coast of Canada, where he resides with his wife, Susan, and their cat, Bella.